“Here it comes---barreling down the track like a runaway train, a no-holds-barred Southern novel as tragic and complicated as the Jim Crow era it depicts." 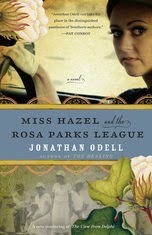 Jonathan Odell's novel, Miss Hazel and the Rosa Parks League is a tale of two mothers, in pre-Civil Rights Mississippi, one black and one white, but it's also the story of a most unlikely friendship. I'm thrilled to have Jonathan here talking about the inspiration for one of his characters, Miss Hazel. Thank you, Jonathan! 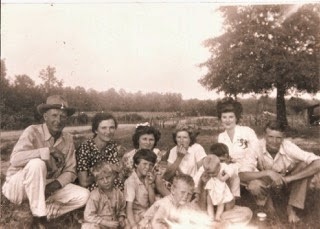 The inspiration for Miss Hazel, the major character from the book, came from an old black-and-white photo, one of dozens in the fruitcake tin we called “the picture box.” It was a treasure trove of old-time photographs of grownups in ancient dress, children more grim-faced than their years, and several mules. 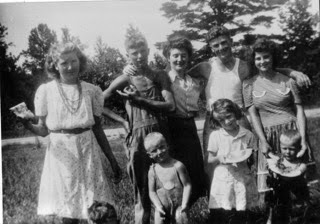 My mother’s side of the family, as poor as they were, had been fervent picture takers. When I was a child, I would randomly pull a picture from the box and say, “Tell this one, Momma,” and she would narrate the story of our family. I remember choosing one particular photo that disturbed me. It was a family portrait from the 30’s. All 14 of them were standing and squatting and kneeling in front of an old paintless barn. But I couldn’t find my mother. When she put her finger on a gawky, half-starved child, I gasped. The little girl’s hair was dry, brittle looking, like a straw. Her dress ill fitting and shapeless, faded. Too short for her spindly legs. Her back was stooped and shoulders slumped. Her eyes cast downward, her head bowed, seemingly in shame, as if already knowing the insult the developed photograph would bring. At age twelve, she looked defeated. It was another family shot, and I recognized Momma immediately. The transformation was remarkable. She was looking directly at the photographer. She has an air of sassiness, maybe even flirting with whoever was taking the picture. Her sisters look uneasy next to her. She was acting the movie star. She held her finger provocatively to her full lips, as if at that moment savoring something exotic, something the farm-hardened family around her could never be aware of. Something indeed had changed. This was the mother I recognized, the pretty, flighty one. Years later I was able to see something in that photograph I hadn’t noticed before. It was the way the skin-and-bones girl held her right hand. The fingers themselves are tensed, rigid, almost claw-like, as if they are preparing to grab hold of something in a death grip, and never let go. The hand is the only thing about this emaciated child that looks as if it hasn’t completely given up hope, as if something inside her, when pushed to the wall, would put up one hell of a last fight. My mother’s obsession with beauty and fine clothes was not mere vanity. It was an audacious strategy. 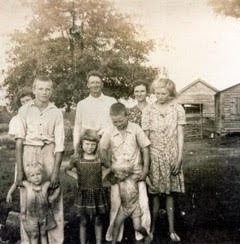 For a girl raised in the bone-crushing poverty of the 1930’s South, there were few options to escape the fate of the farmwives who peopled Jasper County, Mississippi. Mother decided her only hope was to find a man who thought she was pretty enough to get her the hell out. She did. any avenue, no matter how irregular, to save themselves. Set against the backdrop of the O. J. Simpson trial, The Coach's Wife is about love, longing--and basketball obsession. 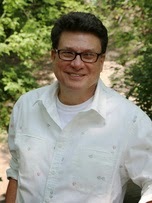 Writer, filmmaker, and family man, William J. Torgerson is an associate professor in the Institute For Writing Studies at St. John’s University in New York. His other novels include Love on the Big Screen and Horsehoe. His screenplay adaptation of Love on the Big Screen won the Grand Prize of the Rhode Island International Film Festival Screenplay competition. You can reach out to Bill via Twitter @BillTorg.Thanks so much for being here, Bill! I always want to know what sparked a particular book. What was the question haunting you that drove you to write? I had to write at least two books to get to The Coach’s Wife. The original spark was that I was married and divorced in less than three years when I was in my twenties. I promised God and everyone that I would love a woman forever, and then I ended up working very hard to get myself to fall out of love with her. Those events haunted me for a long time. Having never considered myself a writer, I began in 2002 by writing down everything I could remember about my divorce. I don’t really know what compelled me to do that other than I had to get “it” out of me. I changed a few names in the story I was writing and called the pages a first draft of a novel. As an high school English teacher, I knew just enough about stories to know that I needed help with mine. I applied and was accepted to an MFA program, (Georgia College and State University in Milledgeville home to Flannery O’Connor!) revised my work, and those pages ended up becoming the material for Love on the Big Screen when Zuke is a college student and The Coach’s Wife which begins following his first year of being a high school coach and teacher. 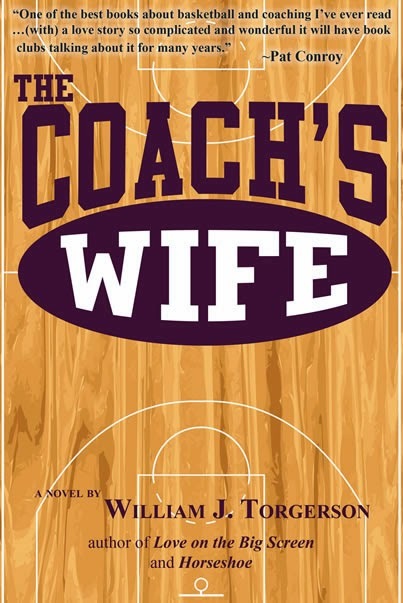 The Coach’s Wife is built around a deceptively simple premise: Zuke, your character, wants to fall in love. But don’t you feel that love is the biggest subject of all? I never thought about “the biggest subject of all.” That is a phrase that would scare me into not writing. I find myself constantly trying to block out what an ordinary subject I have chosen, and how I am writing something that I’m not sure anyone would ever want to read. When I work, especially in a first person narrative like this one, I am just trying to inhabit Zuke’s character and write the sentence that will organically follow what’s just been written on the page. When my character Zuke and his buddies say, “A man without a her is a man without hope,” you are exactly right in that was a premise I felt I could move forward with. What happens, I wanted to know, when someone very badly wants to fall in love and get married? Zuke travels a long way down that path in this novel. So I’ll give you love as being the biggest subject. I grew up going to church, and I went to a college much like my character Zuke. It was a place where we had mandatory chapel attendance (assigned seats and fines for missing) and four required Christian courses. One of the things we did in the classes was to outline the Old and New Testament page by page. The Biblical concept of love is something I’ve continued to carry with me from those days. As Zuke says near the end of the book, the idea that love is patient, that love is not keeping track of the wrongs committed by the person you love, and that love is being kind to another, those are all things that Zuke and I believe we can do when we choose to love others. I think about people as having a choice about who they love. This can sound cold and unromantic. When love means something else--perhaps to possess--confusion and suffering follow. In my books, Zuke begins by saying he loves women he’s never even talked to. By the end of The Coach’s Wife, Zuke will begin to try and enact what it means to love a wife everyday. A lot of the book is about basketball, and you were a coach for many years. What surprised you about being a coach, and more importantly, what surprised you when you transformed that into the book? I became a head basketball coach in Indiana straight out of college at the age of twenty-two. That’s a pretty young age to work with a bunch of people (assistant coaches, parents, fans, administrators, school board members) decades older. There were lots of people telling me I didn’t have any idea of what I was doing and trying to pressure me into doing what they wanted me to do. I’d read this book called Born to Coach by Rick Pitino who is now the coach at Louisville. I’d adopted his title as a sort of mantra for my life believing it was my destiny to be a great coach. I thought if I could even begin to replicate just some of what my college basketball coach had taught me, we’d have a good team. Then we won five games and lost fifteen. That losing record was a great surprise to me. When it comes to the surprises I found during the act of writing, I didn’t realize the degree to which the failure of my first marriage was my fault. Before writing, I felt like divorce was something that had happened to me rather than something in which I participated. I thought of myself as a victim. The act of writing taught me my role in the end of the marriage. Since I’m now fifteen years post divorce and a decade into a wonderful marriage, I find that since I’ve been writing fiction (making things up) I have a hard time remembering what really happened in my life. My stories have become my truth rather than something closer to the reality of the life I have lived. I love that the book is set against the notorious O. J. Simpson trial (as well as Kurt Cobain’s suicide and our finding out that Prince Charles cheated on the beloved Diana). Why did you choose this time period, beside the fact that’s it’s tremendously fascinating? And why do you think popular culture informs our decisions? In the realm of pop culture, both my character Zuke and I looked up to John Cusack’s character in the film Say Anything and Anthony Michael Hall’s “Farmer Ted” in the film Sixteen Candles. Both of these characters decide they are in love with a girl they’ve barely met, and then they boldly go forth and pursue these women until the kiss at the end. I was caught in a cycle where I’d create some fantasy of a person to pursue and then when I would actually end up dating the girl she was of course nothing like the person I’d made up in my head. I tried to convince people to love me, and I think I’d have been better off loving people who would love me back. As for 1994 as the setting, it partly just made sense to follow Zuke’s previous fascination with the 80’s movies that he’d be graduating from college in the 90’s. However, I could have jumped ahead to lots of different time periods. I started with wanting to have a woman desire a fairytale wedding. Princess Diana and her wedding is the woman’s side (in this book) of Zuke’s fantastical expectations about love. I wanted to establish a background of fairytale romances with not happy endings. I read a lot of old newspapers and magazines starting with the subject of Princess Diana and that took me to OJ Simpson and Kurt Cobain and their respective marriages. What kind of writer are you? Do you outline? Do you have rituals? Do you wait around for the pesky Muse? Definitely no Muse. I write like I trained for marathons or worked on my basketball game when I was a player: a little bit everyday adds up to a lot. John Irving (A Prayer for Owen Meany, The World According to Garp) was a wrestler, and he was an early writer I read when I was getting started who had a way of working that made sense to me. I’ve been a word counter, trying for 800 words a day and thinking along the lines that a page a day will add up to over three hundred for the year and that will get me a long way toward a finished manuscript. The word counting came from a writer named Donald Murray who has this great book about teaching writing called Write to Learn. My daily routines have been disrupted in that my daughters are ages six and nine, and this year I’ve started to spend half of the year commuting eight hundred miles between my job in New York and my home in North Carolina. That works begins to get published also takes you out of your routines. (as you know!) When nothing was getting published, I could write my book, start sending it out for rejections, and then start writing the next one. Once manuscripts (stories, novels, journal articles) were published, there are spans of time where nothing is happening and then there are requests for revisions. I prefer to write over an hour but not more than two everyday, but at the moment I find chunks of time (for example, the month I’ll have between semesters of teaching writing) where I’ll write everyday and should be able to finish some shorter pieces of creative nonfiction. I’m excited to hang out with my family now, and I imagine a time in the future when their lives will get busier. I try to remind myself everyday that in fifteen short years my girls will be out of high school. I know that time will go fast, and it’s what I want to most savor about life right now. So you’re also a filmmaker and a professor at St. John’s--how do you manage your time? In addition to what I’ve already said, I say I identify story projects and I see them through to completion. 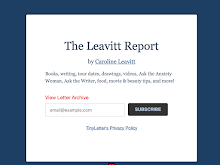 Those stories have been films, articles about teaching, podcasts, short stories, and novels. I want to work everyday and even if I’m only able to work only 150 days a year, I’m still progressing toward the completion of the project. I feel physically sick if I’m not writing and working out most days. Either I love to work, or I’ve just become so ingrained in my habits that I don’t want to do anything besides spend time with my family, work out, and compose stories. I hope for the day my whole family can go for long hikes in the North Carolina mountains and then sit down to read and write together for the rest of the day. I love the idea of my family being our own reading and writing group. We’ll see! I wrote the questions in the back of the book so thank you! When I moved from Indiana to Charlotte, North Carolina to start my life over post divorce, I started teaching at a school where the other teachers nicknamed me Question Boy. I see now that I meet people and right away I’m asking them what could be considered very personal questions. I guess I have tried to tone that down about myself over the years. I’m sure it’s also what drives my documentary filmmaking. I’m decidedly not a chit chat--How is the weather?--kind of guy. As for my daughters dating Zuke, my wife Megan and I can’t stand the thought of them ever being on a date. We love to ask them when they are moving out because they always respond, “Never!” We want to hear that as much as we can while it lasts. On the one hand, if I have to try and think about what is obsessing me, maybe nothing is? I hear you thinking, “Well then, you’re in trouble as a writer.” I have an obsessive personality, the need to be constantly mentally and physically engaged. My brain is all over the place: fracking, my students’ revision of their work, the role of social media in the classroom, the practice plan for my daughters 3rd grade basketball team…. I’ve figured out that if I write and work out most days, I’m able to gain a bit of peace and be able to at least appear to relax as the day turns to dusk. What I’m most thinking about at the moment is finishing two pieces of creative nonfiction that come from two short films I directed: “Yes You May,” is about an Asheville, North Carolina gardener who has spent thirteen years hybridizing a new blue poppy (talk about obsessing!) and another called “The Mushroom Hunter” about my dad and his morel obsessed buddies.